These reusable baby wipes are made from 100% soft cotton flannel and are a great plastic-free replacement for wiping bums, noses, hands and faces. They are handmade in England and are the ideal natural and eco-friendly and natural alternative to disposable baby wipes and paper napkins. To use - Either soak in a liquid solution or use with a liquid spray of your choice. Three pack sizes available - 6, 12 and 24 wipes. Dimensions - 18cm x 18cm. Washing instructions - Warm wash with similar colours. Do not bleach. Tumble dry low. Expect some shrinkage. Product packaging - Paper, paper tape and card. Bryony founded Vesta Living in 2018 after seeing the impact single use products have on our planet. 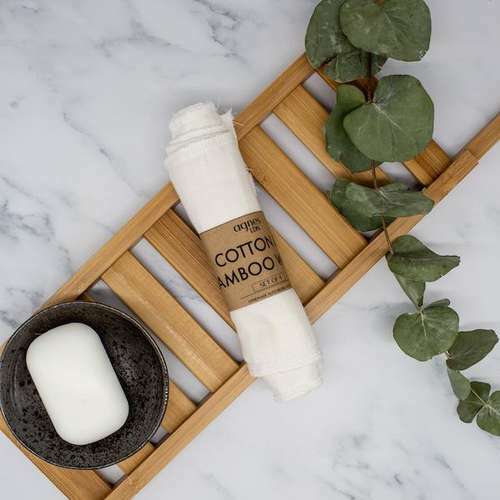 Wanting to do her part, she started Vesta and has now created a wide range of beautifully designed eco-friendly everyday products for the home and body. Vesta makes it easier to live a green lifestyle and exemplifies how small changes in what you buy can have a big impact on helping to protect our environment. Delivery Packaging - Cardboard box and acid free tissue paper.